Today is Buddha Jayanti. More than 2500 years back in the year of 563 BC Siddharth was born on one such fullmoon day in Lumbini Park in the kingdom of Kapilvastu, now in Nepal. This handsome prince was a different one from his childhood. He was not interested in luxuries and appeared lost in thoughts. Sudhodan, the king and Siddharth's father was scared that his son may become an ascetic and leave the kingdom. To avoid such a situation the king got Siddhrath married to Yosodhara, a pretty princess. Siddarth and Yosodhara had a lovely son, Rahul. Yet at the age of 29 Siddharth left the kingdom and accepted the life of an ascetic. This great soul practiced meditation under a peepal tree in Bodhgaya and attained enlightenment, and spread the light of wisdom across the world. 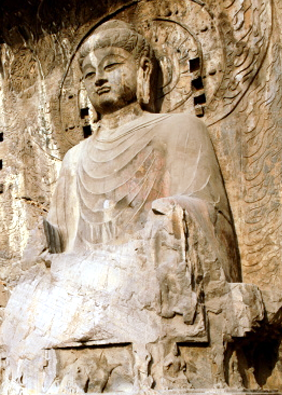 Soon he had a large number of followers in the Indo-gangetic belt, then all over India and with the patronage of great kings like Ashoka, Kaniska and Harshavardhan the tenets of Buddhism - based on non-violence, peace, harmony, spread like wild fire in Asia, from Afganistan on the west to Vietnam on the east, and Sri Lanka on the south to China and Japan on the north. In Buddha, the world saw a new light, a new wave to flood million minds. His fourfold means to get rid of sorrow and eightfold paths to attain enlightenment soon captured the mind of the people. He was taken as a god incarnate by many, a great saint by others, still others from different faiths accepted him as their own. It is a coincidence that he was born on Baiskakh Purnima (Full moon day), attained enlightenment on a Vaishakh Purnima and went into Samadhi (death) at the age of 80 years on the Baishakh Purnima in the year 483 BC. The very name of Lord Buddha evokes peace and deep reverence in each heart. May there be harmony and peace on this earth.